The village of Glen Ellen is nestled in the heart of Sonoma Valley between the Mayacamas and the Sonoma Mountain ranges with Sonoma Creek running gently through it. With Jack London State Historic Park to the west and the Sonoma Valley Regional Park to the East, Glen Ellen offers plenty of opportunities for recreation and relaxation. 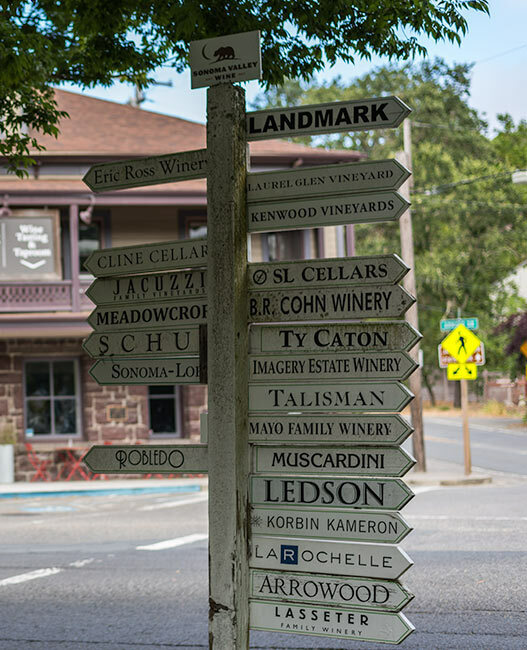 Glen Ellen is known for its rural and natural beauty, and is home to wine tasting rooms, wineries, boutique hotels, bed and breakfast inns, several gourmet star restaurants, as well as vacation rentals located throughout the area. Located in a diverse micro-climate with exposed hillsides and rich soils, the area is a designated wine grape growing region that produces award winning varietals including Cabernet Sauvignon, Chardonnay, Pinot noir, Sauvignon blanc, Semillon, and Zinfandel. The towns hub centers around the Glen Ellen Village Market where locals and visitors can shop or picnic at benches on the tree lined patio. With the 39-acre Jack London State Historic Park and the Transcendence Theatre’s “Broadway Under the Stars” performances in the Park’s old winery ruins, Glen Ellen is a rich paradise. Glen Ellen (population: 784 – 2010 Census) offers a variety of homeownership options and styles, ranging from in-town luxury condos and single-family homes, to rustic country bungalows, to rambling hillside vineyard estates. Could Glen Ellen be your next home? Kick-start your search with our home search. With interactive maps and charts, providing a comprehensive overview of market trends, schools, demographics, and lifestyle data to help you learn all about Glen Ellen. Susan Will Find Your Dream Home! Offering a variety of exclusive listings in the Northern California Wine Country with world class vineyards, stunning views, modern amenities and abundant spaces. Specializing in Sonoma Real Estate, Residential, Land, Vineyard, Commercial and Mixed Use properties.